Objects conservators are responsible for the care of over 47,000 objects in the collection. They are made of inorganic materials like ceramics, glass, and metals; organic materials like leather, ivory, bone, horn, and wood or combinations of both. They range in function and complexity from the utilitarian wooden spoon to the highly decorative gilt mantel clock. Because of the variety of materials, objects conservators deal with many different kinds of deterioration. They rely on the assistance of conservators from other specialties—furniture for wooden objects and paintings for painted surfaces— who compose Winterthur's Objects Conservation Team. Glass and ceramics are vulnerable to physical damage such as breaks, cracks, and chips that were frequently repaired in the past with inappropriate and discolored fills and adhesives. Stains from use and unstable formulations for glass and glazes also create instability and degradation. Metals are subject to physical damage that can cause breaks, dents and deformation, but corrosion caused by handling, pollution, and high humidity is usually the biggest concern as it weakens and disfigures the metal and causes functional and decorative finishes to flake and detach. Organic materials suffer from unstable and polluted environments that encourage degradation, mold, insect activity, and dimensional instability. They are all hygroscopic—absorbing moisture when the relative humidity is high and losing it when it is low—causing them to crack and deform. 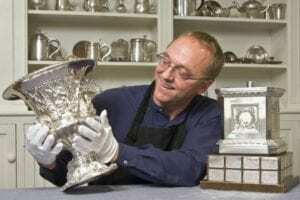 To prevent damage, objects conservators emphasize careful handling and a clean, stable environment . Handling metals and organic objects with gloves prevents naturally occurring acids and oils on our hands from causing corrosion and degradation. Since dust is abrasive and acidic, frequent dusting by the preventive conservation staff or storage in a dust free environment is essential. The relative humidity is maintained at 50% to reduce degradation and dimensional changes in organic objects and discourage corrosion in metal objects. 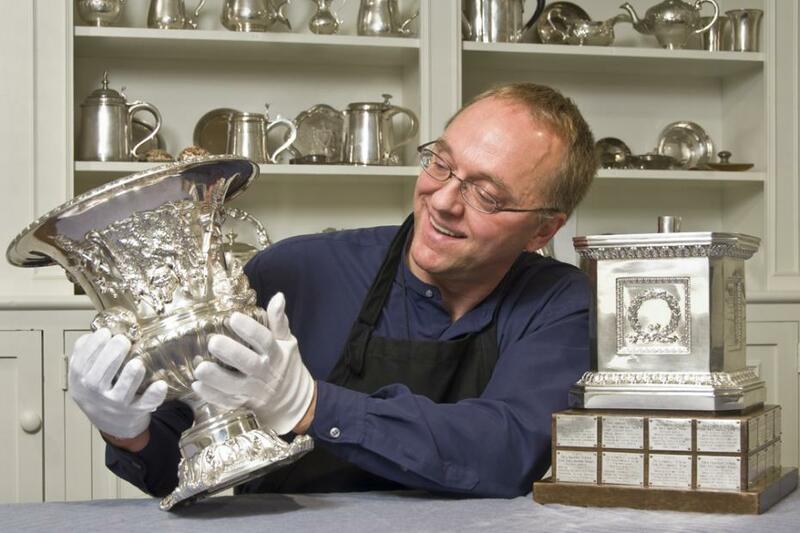 To prevent corrosion and the surface changes and losses that occur with regular polishing, many metal objects in Winterthur's collection are lacquered. Lanterns were once a common object in every household before the introduction of the electric light, but relatively few have survived. This example (1967.1808) was made in the United States or Britain between 1770 and 1830 is a composite object made of tin-plated iron. When Winterthur acquired the lantern, the openings were covered with bull's eye glass sloppily soldered into place. Careful analysis of fragments found under the glass revealed that the openings were originally covered with thin, translucent horn. In addition, the carrying ring had been changed and a thick layer of grime and corrosion covered the metal. After extensive analysis of the surface by the Scientific Research and Analysis Laboratory and consultation with the curator, conservators decided to replace the glass and fabricate a new, more appropriate carrying ring. Using great care, the glass and as much of the solder as possible was removed. The corrosion was gently reduced to recover the natural brownish-grey patina and the metal was coated with a protective layer of wax. A new carrying ring was fabricated from a copper alloy to prevent any confusion with the original. Finally, polyester film was cut and toned to form imitation horn panels. 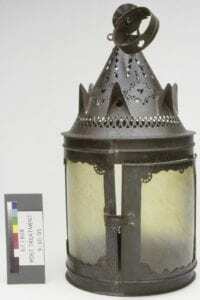 After 85 hours of treatment, the lantern, or "lanthorn" as it was once called, has been returned to exhibition. The intricate decorative features once hidden by corrosion and 20th century additions have been revealed for visitors to appreciate. Top Image: (Left) Lantern before treatment with later bulls eye glass. (Center) Object conservator Bruno Pouliot removing solder from lantern. (Right) Lantern during treatment with glass removed.